Red Tiger Gaming have introduced a slot game with a theme that is a little from the norm. Totem Lightening features as you would imagine totem poles, but it’s the American Indian imagery which really makes this one stand out. 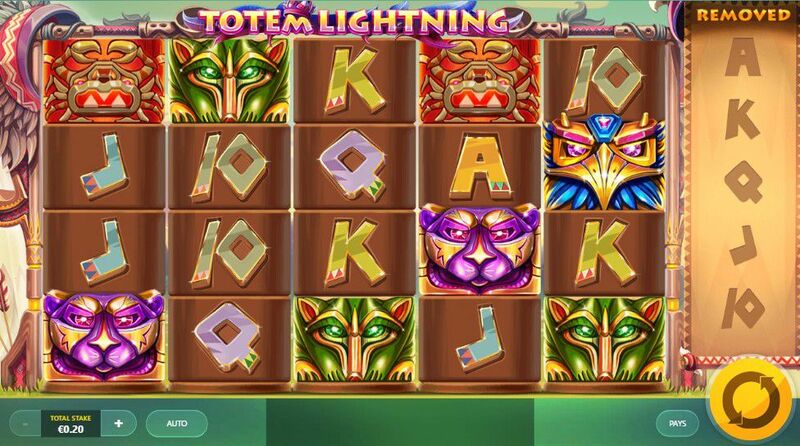 Totem Lightning is a 5-reel, 40 fixed pay line slot that operates with an avalanche style on the reels. It offers an RTP of 95.5% which may seem low to some, but with the avalanche reels we don’t find this to be such a negative point. Symbols are taken from totem carvings such as a wolf, eagle, puma and even a crab, along with the usual card values making up the rest. Quite relaxing pipe music is playing as the reels spin which is almost sleep inducing, if it wasn’t for the excitement of the game that is! Bet Amounts – Betting begins at 20p per spin and can be increased to the maximum of £50 per spin. Totem Lightning may have a low RTP, but the stakes are not high here, so it balances out. We feel that the wins though they may be low, will more than justify the RTP. Wild Symbol – Now this is a turn up for the books, because in Totem Lightning there is no wild symbol; but before you run for the hills hear us out. Whilst there is no wild symbol there is a bonus and the avalanche reels to enjoy. We get that no wild symbol could be off putting, but having played Totem Lightning it actually doesn’t have an impact as much as you would expect. Bonus Symbol – A large gold edged ‘bonus’ symbol will hopefully make up for the lack of a wild. Land three or more of these anywhere on the reels to trigger the Totem Multiplier Bonus game. 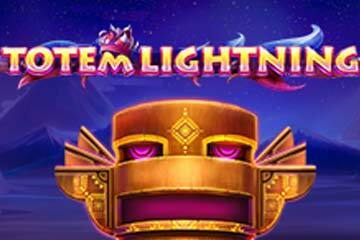 Lightning Strike Feature – Triggered at random a bolt of lightening will strike the reels of Totem Lightning. It will remove the lower value symbols leaving room for bigger wins to be created, as more symbols drop onto the reels to fill the gaps. Symbol Strike Feature – You will see to the right-hand side, a scroll with the lower value symbols on them. As you remove groups of either 10, J, Q, K or A, they will be marked off on the scroll. It works by removing all symbols from the reels that match the winning combination you just made and then you get a respin of the reels. After the respin if you make another match that removes a value from the scroll, the reels will respin again until no further matches are made. Having removed all the values from 10 to A from the scroll, you will be rewarded with a fair sum of money. This is dependent upon the stake amount at the time of the original spin bet and of course the matched symbols removed each time. The lightning strike feature can be activated here as well helping remove symbols and create those all-important winning combinations. Totem Multiplier Bonus Feature – Three or more of the gold bonus symbol will trigger the totem ladder bonus game. You will be offered 5 pipes of which you will need to pick one and it will reveal how far up the totem pole you may climb. Each step on the pole has a cash value and some also have the word collect. Keep picking a pipe from the five on screen and moving up the pole until you land on either the word collect, or reach the top of the totem pole. So, despite the lack of a wild symbol and a low RTP, Totem Lightning really delivered on both exciting game play and the wins too. Fast paced, fun to watch and those wins coming thick and fast, even more so when the lightning strike feature activates. We told you there would be nothing to worry about didn’t we?